One of the challenges we at the City of Boroondara Library Service have set ourselves for 2012 is participation in the Friday Photo 2012 (#fp2012) Flickr challenge. Each week of 2012 we will be given a topic to photograph and in that week we must submit up to three photographs on the Friday Photo 2012 Flickr group. We will be blogging about these photographs on this blog and our reading blog, Bookends, during 2012. The first theme is Beginnings and we had lots of ideas of what we could do for that. We settled on two for Telling Tales and one for Bookends. And what more obvious topic could there be for beginnings of the Boroondara area than an acknowledgment of the Wurundjeri people as the traditional owners of this land? It is impossible these days to get a real sense of how many people lived in what became the Colony of Victoria and estimates vary between 15,000 and 100,000. We do know that there were thirty-eight tribal groups and around the Port Phillip region five main tribes formed what was later termed the Kulin nation. These five including the Wurundjeri all shared the Woiwurring language which used the word "Kulin" for man. The Wurundjeri-baluk area extended out to the source of the Yarra and also included what became known as Gardiner's Creek. Within Boroondara, along the Yarra scarred river red gums which were used for making shields and canoes provide one of the few tangible pieces of evidence of these inhabitants today. However, two projects both initiated by the former City of Hawthorn attempt to redress this imbalance. One is a creative work and the other is a physical space. When you visit Hawthorn Library be sure to take a look at the stained glass window at the east of the building in the local history area. This work, Settlement of Hawthorn, shown above and one of our #fp2012 photographs, was created by artist Gerry Cummins with bicentennial funding in 1988/89 and shows Hawthorn as it would have been before the arrival of John Gardiner and his cattle in 1836. You can see a representation of John Gardiner's arrival midway down the right of the window. And you can see how small he and his herd appear in the landscape. Are they interlopers to an Eden? Yes, that is in itself a very non-indigenous concept but it is what Cummins appears to be representing. The Wurundjeri Garden on the banks of the Yarra near the Wallen Road Bridge in Hawthorn is a successful effort to recreate something of the landscape as it may have been before the impact of Europeans. The project, initiated in 1990, was the brainchild of Dorothy Sutherland from the Hawthorn Historical Society, and was a joint venture between the Hawthorn Historical Society and the former City of Hawthorn. The Garden which continues to be managed by the Society and the City of Boroondara celebrated its 20th anniversary in 2010 and provides a great educative resource about Wurundjeri plants. 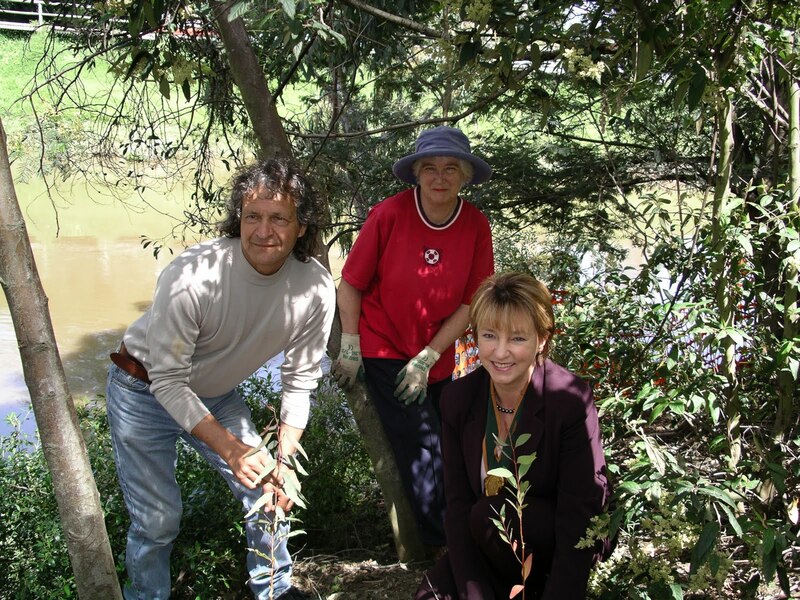 As part of Boroondara's celebrations for 150 years of local government in 2004, we held a Spring Planting at the Wurundjeri Garden and installed a commemorative seat as an acknowledgment of the traditional owners of the land. Pictured above at the planting are Wurundjeri Ian Hunter who provided the traditional welcome, Dorothy Sutherland and the Mayor of Boroondara, Councillor Judith Voce. If you go down and visit the garden, you will be delighted by it. Sit on the commemorative seat and ponder the history of the Yarra and people who have touched it. Celebrate Dorothy Sutherland's vision that has led to the garden being there. You will also discover lots of information there on the display signage but, if you want something to keep, pop into Hawthorn Library and get your free copies of the Wurundjeri Garden Guide for Visitors and the Wurundjeri Garden Plant list.